Sean Dyche is waiting until it is mathematically certain before celebrating the club’s return to Europe after over half a century. 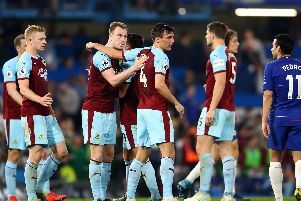 But he accepts Burnley are virtually certain to finish seventh, with Everton needing to make up a six-point deficit, with six available, with a 15-goal swing involved. And Dyche feels his side will deserve such an achievement, as and when it is confirmed: “I've just found that out, I hadn't looked at all the results, just a few chats on the way. “We've still got to make it so effectively, then it's a fantastic achievement if we get there. “You’re implying strongly, and I agree, there's a massive swing involved. A goalless draw against Brighton edged Burnley ever closer to a first European campaign since 1966/67, but Dyche felt his side were slightly below par: “That’s how far we’ve done that we end up disappointed in that. Only because I know the players can perform at a higher level, but, we never really looked in any trouble. They had a really good start to the second half, and a little at the end, but they’re searching for something as well, don’t forget. “A point to them will feel massive. Popey had one good save to make, and we haven’t questioned them much either, couple of set pieces, couple of close things, but a bit of an off game. He added: “The players deserve a huge amount of credit, they have to deliver it. “Really really strong start to the season, that spell of 11 games, and a lot of stories changed then. “You write a different steer, a different feel. To come out of that with the wins we got, to get to a point where we're disappointed today, a bit lacklustre.